Yes, yes. I know that veggies are very good for me, but I just am not a big veggie fan. (I make up for it in other ways.) 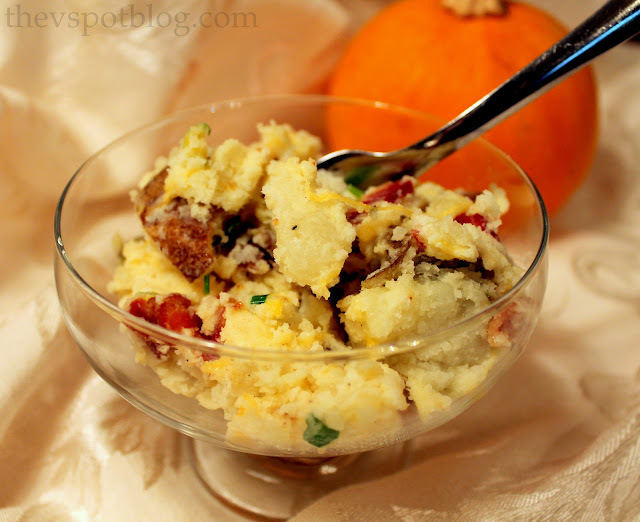 However, I do love me some potatoes… With Thanksgiving coming up, I wanted to put a little spin on regular mashed potatoes by making some Baked Smashed Potatoes. One of the things I really like about this dish is that you can eyeball everything. All amounts can be added according to your tastes. Simple! More salt? Less salt? It’s up to you! Don’t like green onions on your baked potatoes? Leave ’em out. It’s totally up to you. Anyway, here’s what you need to do. I usually figure on 2 to 3 medium sized per person. (I have boys, remember…) Wash the potatoes, and poke them in several places with a fork or knife. 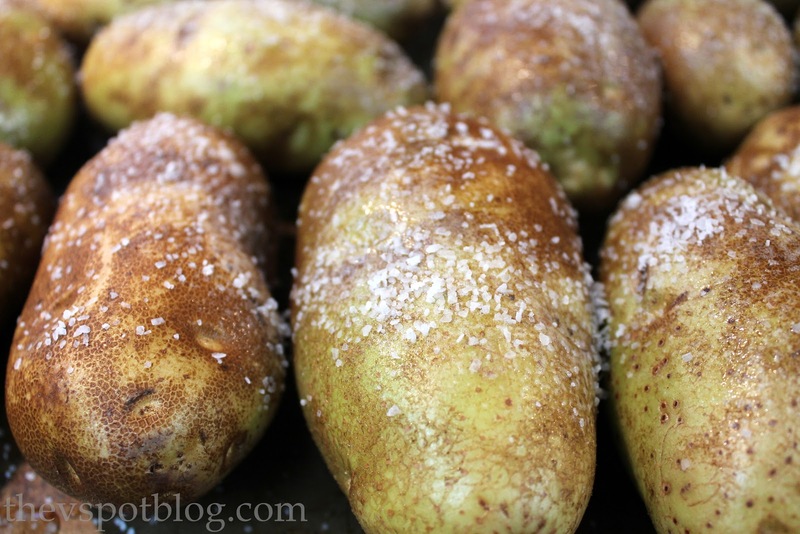 Put them on a baking sheet, spray the potatoes and sprinkle with kosher salt. Pop those babies into a 350 degree oven for about 45 minutes, or an hour or so. 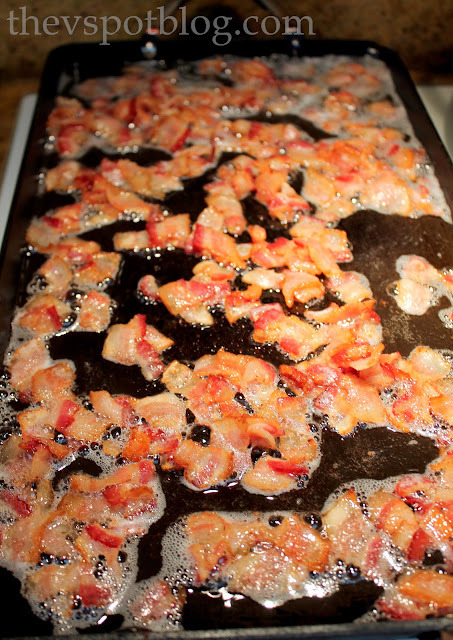 While they’re baking, dice and fry the bacon. I always cook bacon over a medium – low heat… that way the fat renders off slowly and gets nice and crispy. mmmm. Bacon. When the potatoes are done baking, give them a very rough chop and put them in a large bowl. Once the potatoes are in the bowl, add in the Country Crock spread, sour cream, fresh pepper (as much or as little as you want!) and the garlic powder. Use a potato masher to sort of mash/mix/smoosh it all together. Country Crock is nice for this because it doesn’t have hydrogenated oils or trans fat in it. This particular kind has added calcium too. 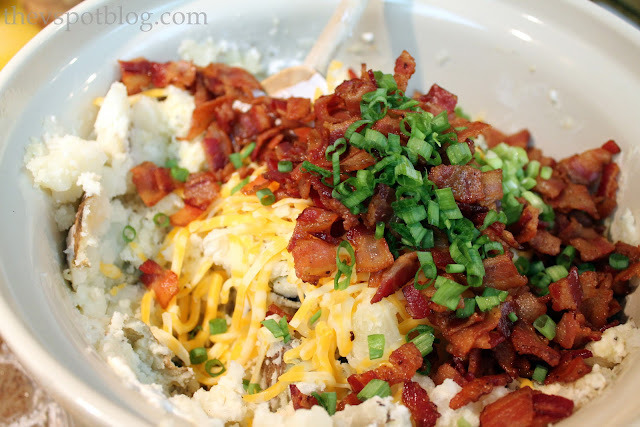 You might be wondering why I even care about health in a dish laden with cheese and bacon…. Um, for the very reason that it’s full of cheese and bacon. Wherever you can fit in a healthier choice, I say do it! Speaking of cheese and bacon. Now’s the time to add it. Do not use the masher to incorporate these ingredients into the potatoes. You want them kind of chunky and, well, smashed. Use a spoon to kind of fold it all together. Give it a taste. This is where you should be adding more sour cream and Country Crock if you’d like it a little creamier. How’s the salt and pepper? Tweak what you need to, then get out of the way…. they will knock you down trying to get to these potatoes. It’s a little scoop of Thanksgiving comfort. 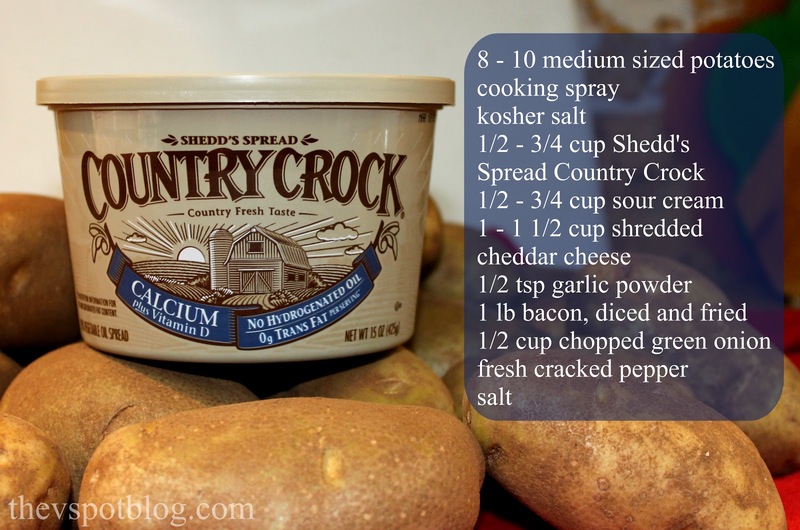 For more Thanksgiving side dish ideas, be sure to check out The Crock Country Chronicle for recipes. You can also follow the Country Crock Thanksgiving Vegetable Side Dish pin board to see recipes from some of your favorite bloggers. Oh my word those look divine! These potatoes are definitely going on the menu for next week. Another veggie dish we love is new potatoes and green beans together with a little bacon thrown in. Simple, filling and yummy! All you had to do was say STARCH and I’d come running. 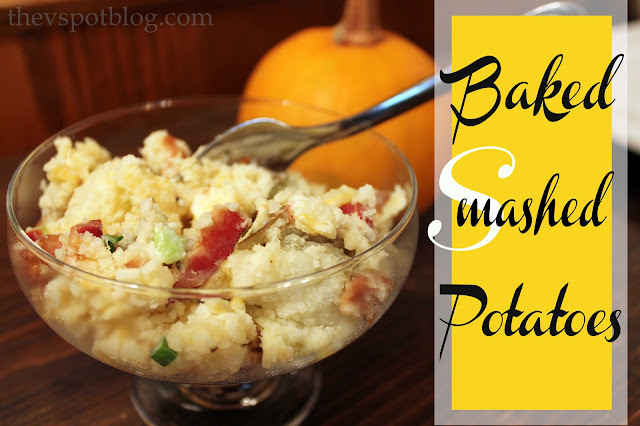 I love their potatoes and mac n’cheese– we use them for a quick meal add-on all the time!! Hope you feel better soon toots! I am pretty sure my hubby would love me more if I made that roasted cauliflower! 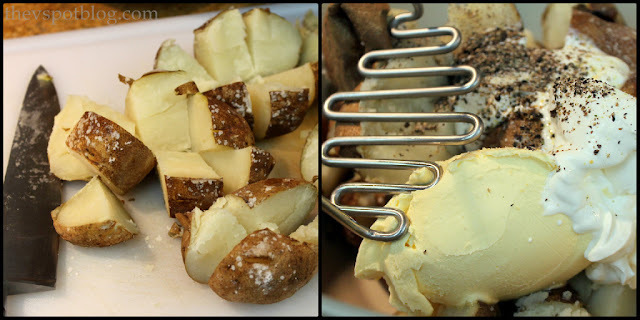 Your potatoes look divine, Viv! I would love to try to the make the roasted squash. Yum! Why the mashed potatoes of course!! I love all things squash so I think the Baked Spiced Squash sounds amazing! I’ve got to go with the cornbread. Mmmmm. I agree – the cornbread! Yum! Potatoes look delish! I will have to try the roasted cauliflower recipe! Those potatoes sound fabulous. I will definitely try them. Spoonable corn bread looks great! Your potatoes look so delish! Cheese and bacon…does it get any better? The cornbread looks so yummy too! I recently tried roasted cauliflower and discovered I love it! Baked spiced squash – sounds yummy! The Roasted Cauliflower looks AMAZING! Chipotle-Lime Coleslaw… a spicy twist on a summer favorite.